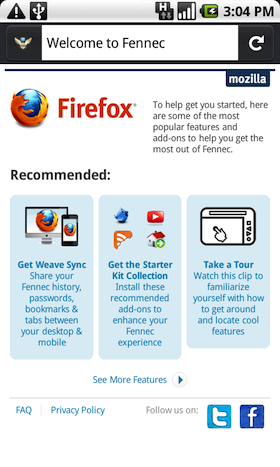 We have been tracking the promising Firefox browser for Android, dubbed as “Fennec”, since long. We reported when the first screenshots of Fennec appeared, we notified you when the first unofficial version of Fennec first made its appearance. Yes were also prompt when the first pre-alpha build of Fennec came out and when Mozilla officially unveiled the Firefox 4 browser for Android. Just last week, we reported that the release candidate of Fennec landed in the Android Market. Yes, we were always excited to hunt it for our readers. Today alongwith Mozilla, even we are pleased to announce that Firefox 4 final browser for Android is available for download. Today Mozilla announced the final release of Firefox browser for Android. The final build of Firefox for Android (Fennec) doesn’t seem to be much different from the previous release candidate which appeared last week. It includes Firefox Sync, tools for sharing browser history, bookmarks, tabbed browsing and support for HTML5 (no Flash). Mozilla has promised that Firefox 4 for Android will be three times faster than the webkit based stock web browser in Android and will also include support for addons. You can download Firefox for Android from the Android Market.